I think these are two of the most sustainable and cleanest energy sources. 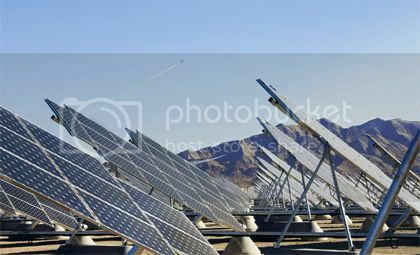 I have fantasies of a future where these play a much more major role in how we power the world than they do currently. Surprisingly, a quick search of Cyburbia doesn't turn up much discussion of them. So let's start that here. Solar comes in two forms: Solar power generation and "passive solar". I think passive solar is brilliant stuff and should interest planners because it is mostly about planning infrastructure to take advantage of seasonal variations. Most people would likely think of it in terms of "energy conservation" but I don't think that's completely accurate. In essence, it uses sunlight to help heat a home (or other building) in winter and shade to help keep it from getting heated up too much in summer. It tends to be very low tech. And my understanding is that it results in a building that is more fundamentally comfortable. Wind power: Well, this is kind of a secondary source of solar power since the sun's energy is responsible for making wind to begin with. I thought about leaving it out of the title of the thread entirely because of that but I know most people don't think of wind power as a form of solar energy. I also like the fact that solar and wind tend to complement each other: if it isn't a beautiful, sunny day, the odds are good that winds are higher than usual. Last, I will note that I also like solar and wind for the potential to support my other dream of having more distributed, small/local generation instead of relying almost exclusively on centralized power generation. I hope this link works. It's a solar monorail demonstration project in Florida. This legislation has been in the pending legislation pages for the last two sessions. I have asked posters on many forums to write in their support of projects like these, obviously Florida residents would have the most clout. An engine with has been shown to convert waste heat and concentrated solar energy into electricity, much better than traditional solar panels. The invention could lead to electricity generators ranging in size from the very large, such as those used by utility companies, to the smallest, for personal electronics for example. This technology could make solar energy cheap enough to compete with fossil fuels. Don't forget about solar hot water heaters - another passive solar device that has seen great advances and interesting applications for everything from heating swimming pools to domestic hot water use and heating (through radiant floor systems). The systems they have today are really remarkable - a single panel system can provide more than adequate domestic supply for a family of four. A lot of people also use a passive solar heating unit that is basically a glazed metal box with a vent in the back that leads into the house. In the ceiling or wall, you have a fan-operated vent that pulls in hot air during the day to offset other heating costs. It doesn't do anything at night, of course, but its a very simple design (you can make it yourself) and saves a lot by not having to heat the home with pricier energy during the day. Here in New Mexico, our power company, PNM, also has an operating wind farm which generates an impressive amount of energy (enough to power 94,000 homes a day, they claim). Unfortunately, you have to pay extra to get your power from this renewable source, which is sort of baffling to me since they are just adding this power to the existing grid - its not like you get a direct line to the wind turbines when you sign up for green energy. Given our climate in New Mexico, you can imagine that we have a long history of architecture that takes advantage of solar potentials, stretching back into the First Americans' use of basic principles of orientation, thermal mass and shading. The vast majority of new construction today takes none of this into consideration and so we are left with acres and acres (and acres and acres and acres) of homes with no glazing on their south sides, minimal overhangs, and numerous other basic non-nos for working with the sun. Around here, that's a big big deal. We're all about sun - all the time. Similarly, the integration of active solar power has seriously lagged here, even though we have several panel manufacturers based here in Albuquerque. In part, I feel the state should be more active in providing real incentives to homeowners and also creating demonstration projects, particularly at government facilities (and we just built three new courthouses in the last 7 years in Albuquerque, but NONE have any significant energy-efficient aspects to them). Slowly, slowly we are seeing some movement. There is a proposal to require all new state facilities to be LEED certified, for example. The new development south of Albuquerque called Mesa del Sol will feature housing and work opportunities, including two solar panel manufacturers, within the same mixed-use community (they will have retail, commercial, offices and light manufacturing). They also, more than most new developments, claim to be working with the sun to devise energy efficient homes. Nothing is built yet, though (though it is ready to go), so we shall see. Lastly, I read a few years ago about an initiative underway in Britain to develop and install a wide variety of small energy generating techniques into millions of homes - things you probably would not even notice. They mentioned things like small turbines placed inside of roof vents (for your hot water heater or forced air heaters, for example) that can generate energy as air moves out of the building. On its own, of course, a unit of this sort would not generate much energy. But multiply that by a million homes and now you are talking about something significant. Solar panels and other devices would also be included and they would all tie into the local electrical grid. This approach does not replace the need for producing energy in large quantities, but it could off-set it very significantly, reducing the need for additional power stations, and reducing energy cost burdens on individual households. cool stuff. Wind power: Well, this is kind of a secondary source of solar power since the sun's energy is responsible for making wind to begin with. Isn't it ironic that both solar and wind energy, you can even say hydro-power and wave power, all come from nuclear energy on the sun. Solar heating, solar cooking, and wind energy (especially for pumping and moving transport across the ocean) can all be very low tech...while nuclear is super-high tech. Did you see any footage of the ocean-going cargo vessel this past week heading from Germany to south America, partially powered by a modern para-sail? Quite amazing. I'm quite excited about the idea of passive solar systems being installed under paved surfaces (see for example Road to solar power runs through hot tarmac). Still, I think financing this with low interest bonds rather than asking motivated residents to go out and get their own higher interest loans is a great idea and likely to get more panels tied into the grid much much quicker. It reminds me of the tax on plastic shopping bags in Ireland that reduced use 94 percent in a matter of weeks. This a simple shift in thinking - instead of giving people credit for bringing their own non-plastic bags, you tax those that want to use plastic. A subtle change with huge results. Of course, they prepped everyone for this well in advance, so it wasn't some huge surprise. Anyway, the Berkeley solution shows a similar shift in thinking. Instead of tax credits or rebates for those that have the gumption, knowledge and motivation to pursue this themselves, the City devises an approach that makes it very very easy to get panels in place and working while allowing people to manage costs in a manner that does not unduly burden their monthly cash-flow. Yeah, but it's fusion, not fission. If I recall correctly, fusion power is some holy grail type thing that people are still looking to create here on earth as some fantasy "perfect" clean, abundant energy source. Sorry I haven't gotten back to this thread. I have been terribly busy. Catch y'all later. We had a solar hot water heater, and solar pool heater, installed in October '07. Our monthly power bill has already decreased substantially. It may take 10 years for the payback, but that's OK. The house I sold in central FL had massive insulation, which we should probably increase here, and the el cheapo solar savings like trees outside the bedroom windows that lose their leaves in winter, but are full and block sun in the FL summers. Sure, we`ve seen monolithic solar farms before, but the 14-megawatt Nellis solar energy system is a beast that stands alone — for now, at least. As of today, this farm is hailed as America`s “largest solar photovoltaic system,” but if all goes to plan, Cleantech America will grab those honors when it completes a massive 80-megawatt project in neighboring California. Nevertheless, this system — which is housed at the Nellis Air Force Base in Nevada — will reportedly generate “30 million kilowatt-hours of clean electricity annually and supply approximately 25-percent of the total power used at the base, where 12,000 people live and work.” Of course, some 140 acres of land have been covered with 72,000 solar panels in order to make it happen, but it`s not like anything else is going out there (CES and rabid gambling notwithstanding). Solar domestic water heating should (IMO) be the first technology to br really pushed. It's proven, low cost, low tech and unless you get days of no sun a steady supply. I think that I read years ago that about 30% of a home's energy use was for heating water. Is that correct? It's interesting, however, that in Tallahassee about 1/3 of the homes could not use solar because of the trees shading the houses. We also must remember that solar & wind can not do it all. We will still have to have back-up sources for when the sun is not shining and the wind is not blowing. Even with very significant conservation I doubt that we could run a civilized society on wind/solar/hydro alone. Especially if we convert much of our transport system to electric as is common in Europe. I don't know exact figures, but I know water heating and the fridge are two biggies. I am not suggesting we try to convert 100% to ..anything. However, I did see an article a few years ago about a large building that had a power bill around $5/month because it went heavy on passive solar and (if I recall correctly) even designed the building to make use of daylight for most of its lighting during normal work hours. I don't recall the rest of the details, such as whether it had solar power panels reducing the energy bill. But if a large commercial building can function well on $5/month, then surely there is tons of room for improvement over we is typical today of residential and commercial buildings. No doubt that we can improve on most buildings. What I would like to see is great improvements to transportation. Not only getting sprawl under control (dream on! ), but converting much of the transportation system to electric power. Might mean more nuc's, but all things considered that may be the only way to decrease greenhouse gases. Historically, sprawl has some relationship to how far you can travel in X amount of time. I don't recall specific numbers, but as faster modes of transit (and presumably more independent modes) became available, people lived geographically further out but it was roughly the same amount of commute time. So my assumption is that as the effects of Peak Oil are felt more strongly, we will likely see a reversing trend. I don't expect cars to go the way of the dinosaur, but I do expect more people to live closer to their jobs, more families to live with one car instead of two and so on. In addition to that, I also assume public transportation will get more use, alternative energy vehicles will become more viable and so on -- in short, I expect there to be diversification in our means of travel. Barring some major new breakthrough, all of those things will tend to put pressure on people to sprawl out less: Public transportation tends to be a less time-efficient mode of travel, battery-powered cars can't go as far as gas-powered cars before needing to refuel (and they take long periods to refuel), and so on. Public transportation tends to be a less time-efficient mode of travel, battery-powered cars can't go as far as gas-powered cars before needing to refuel (and they take long periods to refuel), and so on. In Michigan with the winters and the cloudy days, solar is no as popular here as in other places. There has been however an increased interest in wind power, especially out in Lake Michigan! There have been studies that found that even 30 feet off the ground is enough for a small personal wind energy capture system (WECS). These are being designed to be placed on the sides of houses, or vertical with a shield around them to prevent shadow flicker. There is unlimited possibilities for this new technology within Michigan. What I would like to see is great improvements to transportation. Not only getting sprawl under control (dream on! ), but converting much of the transportation system to electric power. Might mean more nuc's, but all things considered that may be the only way to decrease greenhouse gases. Richi, I'd like to see an electric car solution in which car manufacturers and energy suppliers agree on a standard "battery cassette," that can be quickly changed. You buy your electric car, lease a battery set, pay such and such per month or year. You could have two or more cassettes. You could recharge them at home, or on long trips exchange the one in your car for a full one at fuel stations. Each cassette would have a digital monitor on it that indicates the charge left, and you would pay the fuel station for the amount of power required to top up the battery you leave behind. Fuel station owners could compete with each other depending on the efficiency and cost of their electricity supplier. (Here in Europe we can change electricity suppliers relatively easily, and there is an electricity market. I don't know how this works in the States.) A cassette based system would get around all your worries about refills and re-charge time. I know some people might object to the weight of the cassette etc, but that is a technical issue that I believe can easily be overcome. I have never seen this idea proposed anywhere, but I can't believe its original to me. If someone else has seen it or a similar proposal, please let me know. However, on the extent to which this actually reduces green house gases depends in part on how the electricity is generated. Some studies have shown that hydro-power from dams that drown large areas of forest or prairie actually produce just as much CO2 equivalent for the total power produced as if that amount were produced by efficient coal-powered generation plants. Drowned vegetation produces significant amounts of methane which has a much higher warming effect than CO2. So even our green energy may not be so green. I'm wondering if any readers have seen any statistics for the total CO2 impact of nuclear power plant operations, taking into account the enormous amount of CO2 generated in mining, processing the uranium, building the plant (650 kg of CO2 is produced just in the manufacture of one metric ton of cement), and finally in waste storage schemes, especially those than involve deep burial with life-spans that must reach into the 1000s of years. We are going gungho in Europe towards nuclear to save on CO2 emissions, but I wonder if all the aspects are being considered. It's a real dilemma for environmentalist too. There's a big push to restore drained areas to natural wetlands, but this will almost certainly increase methane production. I guess wind and solar, possibly wave and tidal power, are going to be the cleanest, if not the cheapest energy sources. In what experts say is the biggest investment in the clean and renewable energy in U.S. history, utility officials in the Lone Star State gave preliminary approval Thursday to a $4.9 billion plan to build new transmission lines to carry wind-generated electricity from gusty West Texas to urban areas like Dallas. In a few weeks, this may become the Neverending T. Boone Pickens Thread. Wind energy is preferably in coastal area but the studies conducted in India, did proved that wind mills installed near the coastal area (Shayadari Region, Maharashtra,India) have led to decreasing monsoon rainfall in internal part of the area. This link may be interesting, Israel seems to want to do exactly what you just outlined. There's a lot more information on this project out there, but it should give you the idea. My city just passed a wind and solar energy ordinance, setting some minimal standards for small-scale installations. earlier we got blue sky certification, and are working on increasing the amount of power we get city-wide from renewable sources. None of them are controversy-free. Wind power is ugly, hydroelectric kills salmon, solar can be ugly, wave can affect fisheries and boating. Conservation and efficiency have to be the two top areas for improvements in energy use. To the east of us in the Columbia River Gorge are huge wind farms. Drove past them a few weeks ago. The size of the turbines can't be understood until you have something to compare them to. A truck went by us carrying a turbine blade that had to be at least 60 or 70 feet long. Big mother. Wind power is ugly, hydroelectric kills salmon, solar can be ugly, wave can affect fisheries and boating. Conservation and efficiency have to be the two top areas for improvements in energy use. I have never understood the ugly comment regarding solar panels and wind turbines. IMO they are no uglier than a Direct TV dish, power lines, substations, cell towers, cemeteries or the design of most schools (the vast majority look like prisons). One of ASU's buildings has these turbines...ironic story...they were destroyed by a wind storm last year. The barges, with submerged turbines, would each generate relatively little electricity &#8212; enough to power about 260 typical homes. While dams have long been a source of hydroelectric power, using barges to capture the power of moving water &#8212; a technique known as hydrokinetics &#8212; has been getting attention recently. Federal regulators have issued 144 preliminary permits for similar projects since 2007, with more than 65 on the Mississippi River. &#8220;&#8221;Hydrokinetic turbines are unable to produce much electricity because the river current moves too slowly, he said, adding that he has doubts about the long-term reliability of the equipment. I think that the giant wind turbines are really an awesome sight when viewed up fairly close. There's a large windfarm that crosses US Route 20 between Darien Lakes State Park and the village of Attica, NY, and several of the turbines are fairly close to the road. I had to meet some people in Attica, so I couldn't spend time looking for a good place to take some pix, but I'm going to have to go back and get some shots. A lot of wind-power opponents complain about how the turbines "spoil the view" but the ones in NY aren't being put on pristine land. They're being put mostly on farm land, some of which is still actively farmed, but a good amount of it abandoned, either because the farmers have quit farming or just retired. The turbines are no worse than seeing the old Harvestore silos and rotting dairy barns that litter the countryside. At least the turbines are enabling active farmers to keep farming and ex-farmers to keep their land as large parcels rather than selling it off piece-meal for house lots and "farmettes" -- and that's in addition to generating electricity. They're a win-win prospect for rural areas of WNY. There's been talk of generating electricity like this in the Niagara River between Buffalo and Ft Erie, Ontario. I believe the current around the Peace Bridge is around 18 nauts, which ought to be adequate, but at this point, it's just talk. RWeb -- posting links to SEO sites, white or black hat, is frowned on at Cyburbia, and may be grounds for banishment. As you are a new user, I encourage you to review our Cyburbia Forum Rules. I've deleted the link and will let the rest of the post stand. Thank you and carry on! I'm envious. Here in the US, we don't seem to be making any big strides with renewables and have lost the ability to "pull together". Some seem to consider the push for renewable energy a plot to ruin the economy. I have my doubts that we will have enough in place to buffer our economy against the next round of oil price shocks, keeping us in a state of weak growth. Right now the solar solutions are improving alot. There are BIPV panels that look great on building while creating power. Thin film solar panels that can conform with alot of differently shaped buildings. There are many new buildings converting to using solar energy to power itself. Also, there are mini solar and wind converters which are pretty cute. I think they are going to be in CES this year call Hymini. It's made by one of my favourtie companies. It's a little gadget that can use solar, wind, and hand crank to charge hand held gadgets. I bought one 2 months ago and it worked great when I was travelling. I could charge my mp3 player and cellphone anywhere. Anyway, I hope there will be more and more green innovations in the small and large scale. Wind energy becomes first source of electritcy for Spain in 2013.
ccording to the 2013 advance report of the system operator Red Eléctrica de España (REE), the power demand coverage using wind was 20.9%, compared with 20.8% coming from nuclear. Wind power production during 2013 has been 54,478 GWh, representing a 13.2% increase over 2012. According to calculations by the Spanish Wind Energy Association (AEE), this generation is enough to supply 15.5 million households, a 90% of the total. Nuclear produced 2,337 GWh more than wind last year, but its contribution to the power demand coverage was lower because it consumes more electricity than wind to run its facilities, and this is deducted when calculating power demand coverage. 2013 could go down in history as a great year for the Spanish wind sector. But it is not the case. The wind power companies ended the year still without knowing the economic impact of the Government’s energy reform. If it goes ahead as proposed, it will have an unfair and disproportionate effect on the wind sector. Companies start 2014 mired in legal uncertainty - retroactivity of legislation set up by the energy reform means that the facilities in place are not going to have the expected income when the investments were made, and without expectation about the future, it is going to be difficult to encourage investors to invest in wind power in this country. Wind energy was regulated for the first time in Spain Special Regime Law 54/1997 Electrical Sector, which has been replaced by Law 24/2013 in the context of the Energy Reform. During these 16 years, imports of fossil fuels to generate electricity, as well as emissions of pollutants and CO2 to the atmosphere, have been reduced by over 20%. In total, Spain gets 42.4 percent of its energy from renewable sources. Which parts of Spain's renewable energy policy/implementation can be effectively applied to the U.S. and Canada? ...solar electricity is on track to be as cheap or cheaper than average electricity-bill prices in 47 U.S. states -- in 2016, according to a Deutsche Bank report published this week. That’s assuming the U.S. maintains its 30 percent tax credit on system costs, which is set to expire that same year. Even if the tax credit drops to 10 percent, solar will soon reach price parity with conventional electricity in well over half the nation: 36 states. The chart below shows how far solar will come out ahead in each state in 2016, assuming a worst-case scenario of lower tax credits. The blue bars show the anticipated cost of solar energy (assuming a conservative 20-year lifespan for the panels) minus average electricity prices. Positive numbers indicate the savings for every kilowatt hour of electricity. Florida is one of only five states that prohibit so-called third-party sales from non-utility companies to install solar panels on residents’ or businesses’ rooftops and sell them power. Under such arrangements, consumers can avoid the upfront costs of installing solar arrays and lock in potentially cheaper electricity rates, while providers can earn back their investment and a profit over the long haul. map in article shows those 5 states.